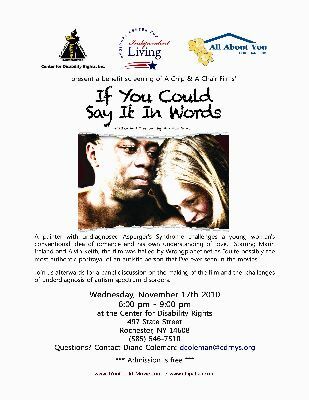 Through A Chip &amp; A Chair Filmsâ€™ partnership with the Center for Disability Rights, the Regional Center for Independent Living, and All About You Home Care, Inc, the new independent film â€œIf You Could Say It In Wordsâ€ will be available to an audience for a special preview screening and panel discussion at no cost on Wednesday, November 17, 2010 at the Center for Disability Rights in Rochester, NY, at 6:00 p.m. Following the screening will be a panel discussion and Q&amp;A session with Nicholas Gray, the writer/director of the film; Paul Remlinger, a local person on the autism spectrum; Dr. Jessica Roesser, from the University of Rochesterâ€™s Department of Pediatrics; and Dr. Caroline Magyar, who directs the Rochester Regional center for Autism Spectrum Disorders and also works at the University of Rochester. For those unable to attend, the film will be released on DVD on November 23; visit www.chipchair.com or join the company's mailing list at http://eepurl.com/LxPp to find out how you can pre-order the DVD, which includes special feature documentaries that feature authors and advocates Temple Grandin and John Elder Robinson. 6:00 p.m. â€“ 9:00 p.m.
For further information on the event, please contact Diane Coleman at dcoleman@cdrnys.org.